From The New York Times bestselling author of The Lotus Eaters, a novel of a California ranching family, its complicated matriarch and an enigmatic caretaker who may destroy them. When Claire Nagy marries Forster Baumsarg, the only son of prominent California citrus ranchers, she knows she's consenting to a life of hard work, long days, and worry-fraught nights. But her love for Forster is so strong, she turns away from her literary education and embraces the life of the ranch, succumbing to its intoxicating rhythms and bounty until her love of the land becomes a part of her. Not even the tragic, senseless death of her son Joshua at kidnappers' hands, her alienation from her two daughters, or the dissolution of her once-devoted marriage can pull her from the ranch she's devoted her life to preserving. But despite having survived the most terrible of tragedies, Claire is about to face her greatest struggle: An illness that threatens not only to rip her from her land but take her very life. And she's chosen a caregiver, the enigmatic Caribbean-born Minna, who may just be the darkest force of all. Haunting, tough, triumphant, and profound, The Forgetting Tree explores the intimate ties we have to one another, the deepest fears we keep to ourselves, and the calling of the land that ties every one of us together. Browse an excerpt on the author's website. The information about The Forgetting Tree shown above was first featured in "The BookBrowse Review" - BookBrowse's online-magazine that keeps our members abreast of notable and high-profile books publishing in the coming weeks. In most cases, the reviews are necessarily limited to those that were available to us ahead of publication. If you are the publisher or author of this book and feel that the reviews shown do not properly reflect the range of media opinion now available, please send us a message with the mainstream media reviews that you would like to see added. This was the ideal book for me at a time when I am recovering from a serious illness and hospital stay. A truly complex novel that can be read in many ways, with an extremely strong woman character who pushes things to the limits and beyond. What it means to love the land, family, strengths and ties, to fight for what one believes in and to not give in just because others believe one should. Soli takes this woman, her motivations and tears them down than rebuilding them into a new form. A serious tragedy almost costs this woman her sanity, costs her family much more and only the land, the citrus groves, the belonging to something bigger than herself saves her that time. Than a serious illness threatens once again all she holds dear and this novel takes a bizarre and strange turn. A woman comes to be a companion and caretaker as she fights the invader to her body and the novel shows us the power of letting go. As the groves rot from the outside, the situation with the young woman from Haiti turns serious and quite scary. Are these woman really demented or is there some sense in the way they feel? What can possibly be the outcome of this strange pairing? Why is her family not stepping in and taking over? So many questions, so complex the problems and yet how satisfying, though strange this original and powerful book. The Forgetting Tree was majestic, monumental, and magical!! An incredibly complex story with well-developed characters, the story basically focuses on two women: Claire, a white-woman dealing with cancer, and Minna, a black-woman who is Claire’s caretaker. Claire met and fell in love with Forster Baumsarg who owned a large citrus farm in California. Claire gave up her literary studies to marry him she was so enamoured. Early on in the story, Claire must deal with every mother’s nightmare – coping with the death of a child. Her young son, Joshua, is found dead near a lemon tree. Claire, already struggling with her loss ends up having to fight breast cancer and keep her family’s citrus farm together regardless of the financial or emotional toll. Minna, makes for an interesting character. Originally from the Caribbean and having suffered through a rather rough life, she ends up in California. She meets one of Claire’s daughters in Starbucks one day and is hired as her caretaker while fighting breast cancer. Minna tells Claire that she is the great-granddaughter of author, Jean Rhys, who wrote ‘Wide Sargasso Sea’, a prequel to Charlotte Bronte’s famous Jane Eyre, focusing on the “crazy woman in the attic.” Minna herself reminds you of that “crazy woman in the attic.” Minna quickly gains Claire’s trust and is soon mixing up elixirs and other concoctions and potions for her to drink as part of her cancer cure. The two women are both damaged but Claire continues to allow Minna to call all the shots. I can’t get into too much more about this story without creating serious spoilers but this is simply a book you MUST read. The Forgetting Tree was masterfully and skillfully written and kept me turning pages late into the night. I haven’t read Soli’s first novel ‘The Lotus Eaters’ but will be doing so now. Reading "The Forgetting Tree" by Tatjana Soli was one of the most beautiful and moving experiences of my summer. I loved Soli's deep explorations of the characters. And I liked how she didn't tell the reader but rather showed and let the reader come to her own conclusions. The story was both fascinating and heartbreaking, and while being entertained, I was also learning about the life of a citrus farmer. Thank you for this book--one of the true gifts of the summer. The effects of tragedy and healing growth through relationship with the land and with a companion steeped in mystic beliefs form the backbone of this lush, dramatic novel. Wonderful storytelling. Right within the first 20-30 pages the reader will be drawn irresistibly into an ever-changing orchard of characters from differing backgrounds and cultures facing inexorable desires, devastating losses and dark fears. So many stories within stories. . . Tatiana Soli’s rich writing style never lets go. Read it and let your mind explore Claire and Forster Baumsarg’s challenges and transformations and, then sometimes, even one’s own. 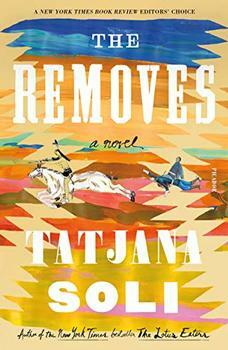 Tatjana Soli will be visiting our local library early next year and I very much look forward to meeting her and hearing her discuss this work as well as her first novel, The Lotus Eaters. I am still torn between choosing that or The Forgetting Tree as a future reading selection for our book discussion group. This engrossing novel is about loyalty, love, and loss. It explores how a tragedy affects the direction and life path of all impacted. The main character, Claire inspires empathy, sympathy and at times anger as she faces the personal hardships that surround her and struggles to maintain her hard-earned life and land. When she meets a character who's response to early tragedies is much more sinister than her own the reader is pulled in and a bit breathless as page by page the intensity mounts and the question is whether Claire will prevail or succumb like the frog swimming in the ever hotter pan of water (the author's analogy). This was a very satisfying read and would be a good choice for book clubs. Tatjana Soli is the bestselling author of The Lotus Eaters, The Forgetting Tree, and The Last Good Paradise. Her work has been awarded the UK's James Tait Black Prize and been a finalist for the Los Angeles Times Book Award. Her books have also been twice listed as a New York Times Notable Book. She lives on the Monterey Peninsula of California.